Fast pyrolysis holds promise for producing heating and transportation biofuels for the renewable energy market. This article describes how fast pyrolysis works, its advantages and disadvantages, and how it might fit into our renewable energy future. Processing biomass feedstocks such as perennial grasses, woody plants, and agricultural residues into useful fuel products is one of the most critical components of a robust renewable energy system. One promising method of doing so is fast pyrolysis, which converts biomass into liquid biofuel and other energy products. Other ways of producing liquid biofuel include gasification, fermentation, and solvent liquefaction. 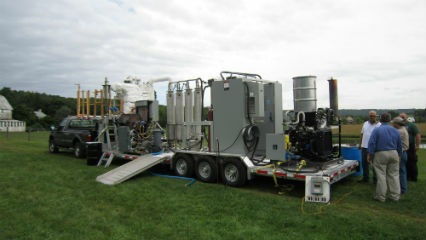 FarmBio3 mobile pyrolysis system travels among farms simulating the real-world scenario of multiple on-farm units that convert feedstocks to bio-oil, which is delivered to a regional biorefinery. Photo credit: USDA-ARS Pyrolysis Team. In addition to bio-oil, fast pyrolysis produces a range of other renewable energy products. Although still in its infancy, commercialization of this method is steadily advancing. One approach, shown here in the image, is to build a mobile facility that functions as part of a decentralized system of smaller processing plants that transport bio-oil to a central refining facility. Fast pyrolysis is a thermochemical process during which a lignocellulosic (dry) biomass such as perennial grass, corn stover, or wood is rapidly heated to about 500° C. in the absence of oxygen and then quickly cooled in a reactor. The process converts the biomass into carbohydrate-based compounds that include condensable vapors; these are condensed into liquid bio-oil, the primary product of fast pyrolysis. 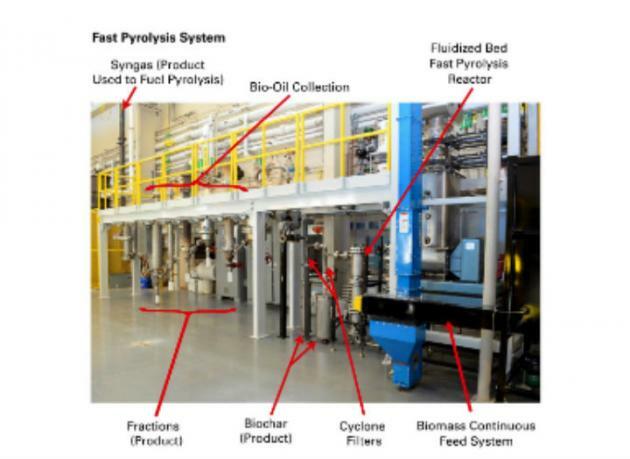 Fast pyrolysis can convert up to 75 percent of biomass input into bio-oil, yielding about 135 gallons of bio-oil per ton of biomass. Bio-oil is made up of water and many types of organic compounds that can be easily upgraded into heating oil and, with extensive treatment, transportation fuels. Fast pyrolysis also produces char (charcoal or biochar), and flammable gases and vapors (including methane, hydrogen, and carbon monoxide, which can be burned to heat the reactor thus sustaining the fast pyrolysis process). 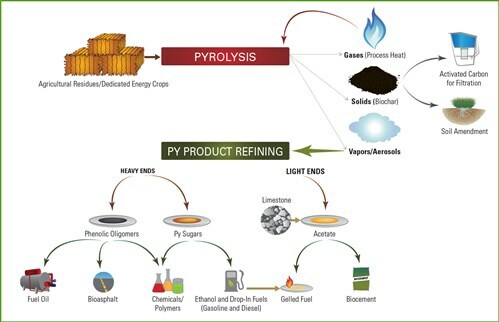 Concept for Pyrolysis Refinery Photo courtesy of Bioeconomy Institute at Iowa State University. Bio-oil is an emulsion of water and organic compounds derived from both the carbohydrate and lignin in the biomass. These organic compounds are mostly alcohols, aldehydes, carboxylic acids, esters, furans, pyrans, ketones, monosaccharides, and anhydrosugars from the carbohydrate and phenolic compounds from the lignin. Through further processing, they can be turned into substitutes for fossil fuel in heating, electricity generation, and transportation. Current estimates are that it would cost between $3 and $4 per gallon to convert corn stover to bio-oil via fast pyrolysis and then upgrade it to gasoline and diesel fuel at a large-capacity refinery. Bio-oil produced from fast pyrolysis has a low viscosity and is about 15 to 20 percent water. Oxygen is a major contaminant constituent of bio-oil, and contributes to its poor stability in storage or when heated. Adding a catalyst to the pyrolysis process can produce a higher grade of bio-oil through deoxygenation. The resulting bio-oil is easily stored, but in order to be useful must be upgraded into functional products, especially if it will be used as a transportation fuel. Bio-oil can be refined using variations of conventional petroleum refining technology, such as hydrotreating and hydrocracking. The process of making bio-oil is relatively simple and quick. All of the biomass components can be processed into a fuel product; none are wasted during the pyrolysis process. Pyrolysis reactors are relatively simple and have reached some level of (limited) commercial production. A fast pyrolysis facility can be built on a relatively small, mobile scale in order to produce bio-oil close to the biomass source and then transport it to a central facility to be upgraded. The heating value of bio-oil is only about half that of petroleum-based heating oil by weight. Bio-oil is acidic and highly corrosive to metal. The price of fossil fuels has recently dropped precipitously, but no one expects them to stay low forever, nor will our need to reduce greenhouse gas emissions disappear. Therefore it’s essential that we continue to develop all segments of the renewable energy industry to help shrink our consumption of fossil fuels and reduce greenhouse gases. The commercial future of using fast pyrolysis to convert biomass to energy products is promising. Researchers are steadily developing innovations that increase yields of bio-oil and fractionate the products of fast pyrolysis into compounds that can be more efficiently refined into useable products. Why Are We Producing Biofuels? Robert C. Brown and Tristan C. Brown. Brownia LLC, Ames, Iowa, 2012. Robert C. Brown, Anson Marston Distinguished Professor of Engineering and Gary and Donna Hoover Chair in Mechanical Engineering, Iowa State University. Samy Sadaka, Assistant Professor, Extension. Biological and Agricultural Engineering, University of Arkansas. Akwasi Boateng, Lead Scientist, USDA-ARS, Eastern Regional Research Center, Wyndmoor, Pennsylvania.